On Saturday, our boys received their first visit from the ghost of cup football past. It came in the form of Ben Watson – the ginger fella who single-handedly incinerated our dreams of a second FA Cup trophy in three years with one twist of his head back in 2013. After 55 minutes of play at Vicarage Road three days ago, that visit mutated into a haunting as Watson gave Watford the lead directly from a corner. Guns at the ready, ghostbusters Yaya Touré and Sergio Agüero ensured the former Wigan midfielder wouldn’t be enjoying another unlikely triumph over us, but it was a win too close for comfort. On Wednesday night, City will have their second visit, this time from Roberto Martínez – the man who coordinated that famous Wigan victory that also hammered the final nail into the coffin of Roberto Mancini’s tenure at the Etihad Stadium. Even if Spanish Bobby’s Toffees take the tie out of our reach tomorrow night, there’ll be no manager slaying this time round – Pellegrini’s job is likely to be safe until the mighty Pep Guardiola takes his place at the end of the season – but wouldn’t it be nice if Manuel and the lads went on to claim the first trophy of the campaign? In my opinion, we should be hopeful of doing just that. Slumping in 11th place in the league, you’ve got to say Everton are underachieving under Martínez and with the Premier League January sales now officially open, Goodison Park’s fax machine is going to be absolutely chocka with offers and inquiries. Romelu Lukaku, Ross Barkley and John Stones – players that could quite easily slot into our own team based on their irresistible form this term – could be on the lookout for new teams this month and it may take some convincing to keep them on Merseyside. In truth, with the squad they have, Everton should be aiming for the top four. Lukaku has more goals than any other player in the league, Barkley has six goals and seven assists and Stones, aged 21, was included in World Cup and Champions League winner Gerard Piqué’s World XI last year; yet Everton sit in the bottom half, have drawn nine games and have a worse defensive record than any other team in the top 13. Martinez’s ‘Wigan-esque’ tactics and the team’s mentality have been blamed for their shortcomings, and it’s fair to say the Capital One Cup represents their best chance of claiming any silverware in 2016. However, and as we all know, an away trip to Goodison Park is never straightforward. After a barren run of three years, our record there has definitely improved. We haven’t lost in our last three visits, and won comfortably back in August when Kolarov and Nasri bagged in a 2-0 win. I wouldn’t take too much confidence from that win, though, especially considering how poor we were at Watford on Saturday. Everton will be well up for this one, and although the prospective battle between Lukaku and Mangala will have a few of our fans peeing their pants, it’s the Kolarov vs Deulofeu match-up that worries me. The winger has 11 assists in all competitions and links up superbly with Lukaku. He’s also incredibly quick and will have fun down our left flank all night long if Aleks is selected over Clichy. If Gael’s 100% fit, I’d definitely go with him for this game. As for our lot, Pellegrini says Bony has “a kick in his calf” and is a doubt for tomorrow. Other than that, we’re fit and ready to go, and Bony’s injury may see Kelechi make a welcome return to the squad. Call me negative, but I’d take a draw tomorrow night. 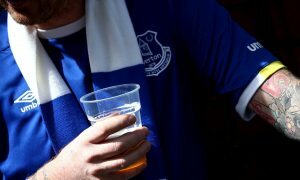 Let’s get out of Goodison unscathed and then finish the job at home. I’d bite your hand off for a 1-1, right now.